A touching holiday tale that can be enjoyed by those of any religion. “I cant wait for the Enforcers’ Christmas Ball!” Jake exclaims from inside the refridgerator. “Yeah…Maybe I can get a glimpse of…” Blink, blink. Chance stops mid sentence and takes a long pull at the drink in hand. “A glimpse of….? Do we have a crush on some certain she-kat named…Callie Briggs?” Jake prods. “No!” Chance says all too quickly. “Good, cause she’s mine!” Jake laughs evilly. Chance just rolls his eyes and turns around. And runs smack into an open cabinet door. The door flies off with a loud CRACK! Chance stumbles back momentarily, but catches himself, trying to focus his sight. “Oh, crud….” Razor mutters under his breath. Callie unhappily hails a taxi. Across the street from City Hall, there is a bell-ringing Santa Claws. Down the road, MegaKat Central Park is illuminated by the thousand-lighted ten-foot tree they had lit last night. In front of it, couples skate on the ice, holding paws and laughing, spinning and spinning, laughing and spinning…. Callie sighs and gets in. In the beginning, when she first moved here to MKC, she found being single highly liberating. The first Christmas, it was just her, in her apartment, sipping hot cocoa and watching “Its a Wonderfur Life” with Gennie, her iguana. Who needed a man? She had friends and freedom. But now…Callie turns to look at the skating rink and Christmas tree, disappearing as fast as her youth and hope of finding a mate. “Where to?” The cabbie asks. “The Salvage Yard.” At least she was getting her car back for Christmas. Chance and Jake were so quick at…wait. And suddenly, the Deputy Mayor gets an idea. The Deputy mayor gets an awful, awful idea. She will steal a mechanic for Christmas. Commander Ulysses Feral steps out of the locker room, only to be greeted head-on by his niece, Felina Feral. The commander straightens up. “See what I mean?” He stiffly walks in the direction of his office. “Hmm…” Felina ponders, and heads for the parking garage. I will get to the bottom of his problem with Christmas. Callie pays the cabbie and steps out of the car. It is cold, after being in the warm vehicle, and she wraps her fur-trimmed coat tighter around her. First one I see, he’s it she says to herself. Jake hold out his paws. “No! No! I’ll drive you home. Just hold on a second.” Leaving her on the driveway, Jake runs into the house. “Mr Claws!….Mr Claws!” There is no answer. Jake then runs frantically through the house, looking for Chance. He finds him in his room, in front of the mirror. He has an old red bath robe on, and a Santa hat that’s been kicking around for who knows how long. “Um…yeah. Gotta go!” He races out to the driveway and meets Callie again. “Sorry Miss Briggs.” She smiles. “No problem.” They both climb into the tow truck and take off. “It was nice of you to invite me in, Miss Briggs, but I have to leave.” Sure, I get a moment alone with Callie, in her house much less, and I have to deal with…Santa Claws. “Oh, but won’t you stay for a drink?” Callie asks, edging for the door. Jake likewise makes for the door. Suddenly Callie pounces on the door and locks a double-sided key lock, placing the key in the pocket of her pink suit. With Jake left speechless, she runs for the bedroom and takes the sash from her robe. She walks in as Jake tries to yank the door open. She takes him by the arm and flings him into a dining room chair. She then ties his hands to the legs. “Now, my dear, we are going to have a nice Christmas at home for once.” She grins. Jake is woken up by the sound of Callie leaving. He looks down and sees he is tied to a chair. Callie sticks her head back in the door as Jake tries to pick the chair up and walk toward the door. “I’ll be back tonight, dear. Meanwhile, I’ve gotta make sure the Mayor has his Santa suit. Ta!” She blows him a kiss and runs out, locking the door. Feral squints his eyes at the figure. He is clothed in a mechanics uniform with Enforcer boots, and a red bathrobe, with a Santa hat upon his head. “Liar!” Manx yells. A child bursts out crying and runs to its parents. The rest of the children follow suit. Chance lowers his ears around the Santa hat and growls. “You made a child cry, villain! Face the wrath of SANTA!” Manx yelps and starts to runs away, but Chance tackles him at the base of his legs, and they both fall hard onto the dance floor, knocking a few spectators over. The band has long since stopped playing, and they gawk in silent horror. Chance, having pinned the plump and less agile Manx to the floor, begins to routinely pound his fist into Manx’s face, who is making strange gurgling noises. Feral gets up and runs to pull Chance off, but is knocked aside. Stumbling back, he runs into the stage. Thinking fast, he jumps up on stage, grabs a cello, and runs for Chance. He swings it like a baseball bat and knocks Chance flying. “Ah! My cello!” Feral looks at it. It is rammed in through the back, the strongest part of the instrument. “Sorry,” he says, and throws it back on stage. A group of Enforcers have moved in to handcuff Chance, who is knocked out cold. The children bawl as people file out of the room, directed by Felina. Paramedics rush in and put Manx onto a stretcher. Callie sits in the corner, crying hysterically. She runs up the stairs and backstage, tripping and accidently hitting a lever. Back in the ballroom, eight fake reindeer fly on strings in the air near the ceiling. Feral glaces up at the sudden movement just as Dasher comes flying down low by his head. “AHHHHH! REINDEER!” He ducks down and covers his head as Prancer comes at him. “Mommy! Make the reindeer go!” He sobs. A stretcher comes in for Chance, who is just now coming to, with a big gash through his forehead. “I don’t know why we treat you people.” He slams the door shut, and the ambulance takes off. “Thanks for finally believing me.” Chance thanks the doctor. “Thanks but no thanks, doc.” Jake isn’t there. There’s gotta be something wrong. Chance heads out the door, still dressed in mock-Santa garb. “There he is!” Someone yells, and a group of people race after him. He runs for it and luckily finds an elevator. The woman next to him yelps and pins herself to the side of the elevator. “Now. Do you know where Jake is? Have you seen him around the hospital?” he asks hopefully. Callie shifts uncomfortably. “No.” She shakes her head firmly. Being the one stunned this time, Chance releases her arm. “I was lonely, okay?” She sobs. “I-” The elevator door opens and a whole crowd of people turn around and point. Chance makes a break for it, pushing through the angry mob of parents and Ann Gora, who sticks a mike in his face. “Talk to the doctor!” he yells, and runs out the door. There are more people outside, and an ambulance unloading a patient. He runs for the driver’s side door and opens the door. He pulls the surprised kat out and his partner, too. He floors the gas and, hoping he doesn’t run over anyone, takes off, the back doors flapping wildly closed and open. Jake turns his head from the TV when he hears banging on the door. Suddenly, in a shower of splintered wood, Chance bursts in, still dressed as Santa. “I know. I was working on them for hours.” Chance glances at the television. Jake had been watching David Litterbin. Was it eleven already? Chance shakes his head and starts in on the knots again. Callie suddenly bursts into the room. Chance and Jake both look up at Callie. She looks downright crazy. Her normal perfect hair is messed up, her jacket gone, heels off. “Shut up! That’s beside the point! All I wanted was a quiet Christmas, but this time not alone! I need someone too! I get lonely too you know! I may be Super Paperwork-Callie, but I’m not Super-Feeling Callie.” She throws herself against the wall and slides down it, crying. Blink, blink. Chance suddenly gets the knots loose. A flood of Enforcers enter the room just then. They look at the broken door and Callie looking ragged and crying, and head for Jake and Chance. Felina motions for them to let Jake go. “We can let him go, but not this guy.” She slaps cuffs on Chance. Callie smiled and mouthed ‘Thank you!’. Chance just dropped his head. Looks like he would be spending Christmas in jail. Three days later, Chance walks through the hospital hallway. He was let out on a technicality: turns out one angry parent had a gun, and had shot at him, hitting the ambulance. So, technically, stealing the vehicle was self defense. Chance sighs and exits. He stays outside the door for a moment, and Callie comes from the room. Chance flicks his tail. “It’s Mr Furlong. And anyway….” Chance looks hard at Callie, but can’t keep up the tough-guy stance. Her denim blue eyes plead so softly with him, a look of pain is imprinted on her face. Chance relaxes his stance a little and sighs a resigned sigh. “It was no problem, Ms Briggs.” She smiles at him. Felina strides by swiftly. Chance leaves Callie to walk beside Felina. They both reach the elevator. “Fine, now. But the doctors still can’t figure out how an extremely healthy kat in his prime could have three consecutive heart attacks like that. And he’s perfectly fine now…Strange.” The elevator stops and Felina gets off. She smiles and waves. “Bye!” Chance calls as the doors close. 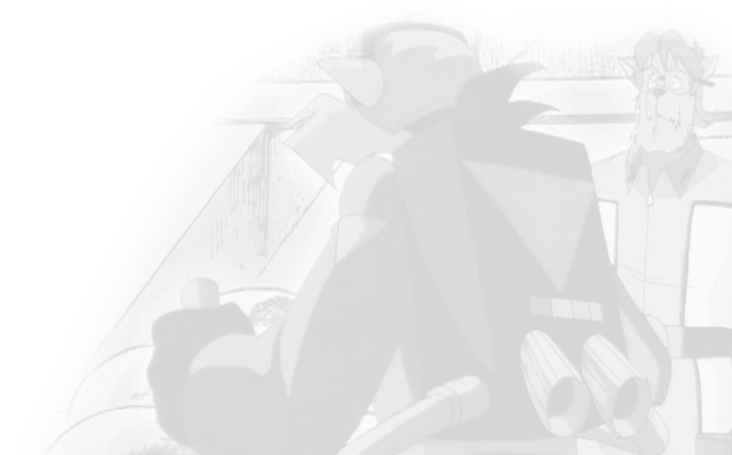 He takes a moment to take a breath as he waits for the first floor, leaning against a wall. The doors open and Jake turns around to face Chance. “Yeah? That must have been a new experience.” Chance smacks the back of Jake’s head. So…anyway. Oh yeah…The whole *official* disclaimer thing while I’m at it. It’s a fan fic. I’m using previously created and used characters. 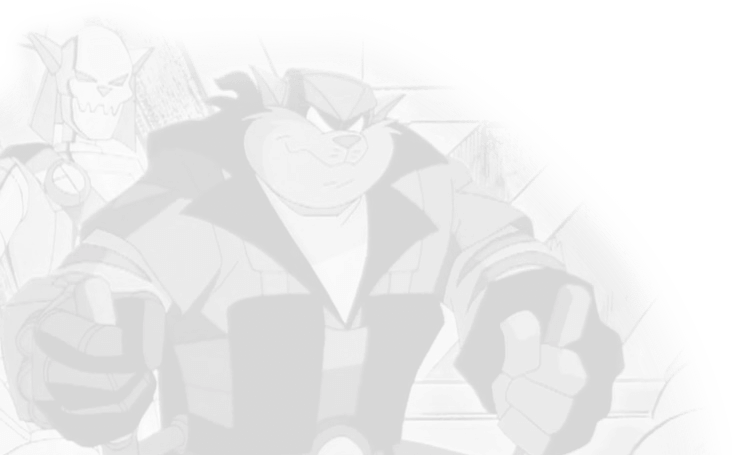 If you dont like what I’m doing with them, go ahead and complain, but I ain’t changing it unless you *own* The SWAT Kats….so….